This is the age of the World Wide Web. People around the world are now connected. They do business, communicate, and work globally – without leaving the comforts of their homes. The internet has profoundly changed our ways of living. It led to the creation of the virtual sphere that includes online businesses – stores, banks, and entertainment hubs, libraries, schools, online social media platforms, online stores, dating apps, and online service centers. The internet and the changes it brought about spawned the online freelancer. An online freelancer is a new kind of worker that only exist in this age. They are the web developers, designers, bookkeepers, writers, marketers, virtual assistants, coders, researchers, graphic artists, and consultants that make the virtual world a better place. They are independent. Freelancers are independent workers. They do not require close supervision. In fact, they prefer working on their own. If you’re planning to engage online freelancers for some jobs, know that you must give them breathing space. Give them the tools, instructions, and other necessary job details. Then leave them alone to do their job. They work hard, and twice as efficient. They work hard, and twice as efficient. They work harder than the typical employee. Online freelancers usually working with more than one project and have contracts with a couple of clients at a time. That doesn’t mean they’re not loyal, they just work twice as faster. The absence of the usual workplace bureaucracy, no commutes, and independent makes them more efficient workers. They value time, but struggle with time management. They value time, but struggle with time management. There is a reason they prefer freelancing to holding a regular 9-5-day job – time freedom. They do not like being trapped in a cubicle, working for specific time, place, and pay. They love the freedom that freelancing allows them to travel, sleep, work, or eat whenever they want. But, that freedom is also their downfall. Because nobody is there to monitor or manage them, many freelancers struggle with time management and productivity. They are confident. You cannot undermine the confidence of a freelancer, for only a confident person will leave a secure job with a regular pay and work solely based on his or her talent and capabilities. They hate dress codes. Freelancers are non-conformists. They do not like being put in a box and be required to dress and look per dictates of someone else’s standards. The love comfortable clothes, but they will dress to the nines only if they want to. They love to travel, but hate commutes. They love to travel, but hate commutes. Freelancers are nomads. They like traveling, living and soaking in different cultures. They are not afraid to learn and experience new things. And they work as they travel. What they hate is the daily boring and stressful commute from home to work. They value good communication. Because of the diversity of culture and people they meet in their work, they value good communication in gold. They appreciate clear instructions, honest and constructive feedback, and clients hearing them out. If you can’t respect the accent or the culture, stay local. 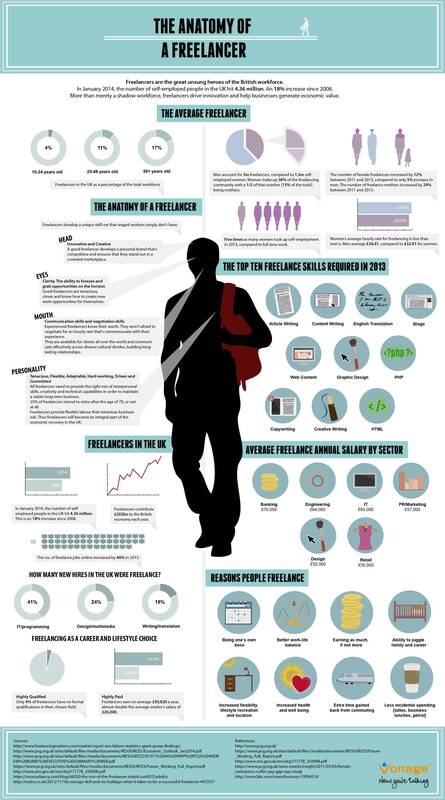 Here is a visual manifestation of an online freelancer and online freelancing by the numbers. Learn how you can send money faster, easier and with no FX and minimum charges to freelancers worldwide. Sign up for FREE.